ICVA advocates to ensure humanitarian financing meets the needs of populations affected by crises. We also strive to help NGOs, particularly national NGOs, understand, influence and have better access to humanitarian financing. ICVA’s Humanitarian Financing Working Group was established in 2013 to advise the ICVA Secretariat on its work related to humanitarian financing. It is a forum for ICVA members and other NGOs to discuss humanitarian financing developments, exchange information, understand NGOs views and concerns, and identify opportunities for collective advocacy. The Donor Conditions Task Force is an NGO-only platform to explore how to reduce the burden of donor conditions and improve the efficiency and effectiveness of humanitarian response. The work of the DCTF has fed directly into the Less Paper More Aid initiative. It also establishes linkages between many of the workstreams and commitments identified through the Grand Bargain – particularly the commitment to simplify and harmonize donor reporting, promote transparency, and reduce duplication and management costs. ICVA and OCHA/CERF co-chair the IASC’s Task Team on Humanitarian Financing. Objectives of the current work-plan seek: 1) Adequate and accessible humanitarian financing; 2) Reducing burdensome donor requirements; 3) Contribute to aid effectiveness by reducing the humanitarian/development divide; and 4) Improve transparency of funding flows. The Work Plan also includes operationalization of the Grand Bargain (GB) as a cross-cutting issue. The Country Based Pool Funds (CBPF)- NGO Dialogue Platform is an informal forum created in early 2014 for regular dialogue between OCHA and NGOs to inform global policy issues related to the management of CBPFs. The Pooled Fund Working Group was established in 2007 and consists of major CBPF stakeholders including contributing donors with decision-making authority at the capital or HQ level, recipient UN agencies and NGOs, and administrative agencies such as OCHA and UNDP. There are currently 3 NGO representatives in addition to the ICVA Secretariat, including Interaction (represented by Rachel Criswell of World Vision); Oxfam GB (represented by Ben Garbutt); and UOSSM (represented by Zedoun Al Zoubi and Khaula Sawah). The ICVA Secretariat was one of the Sherpas who negotiated the Grand Bargain on Humanitarian Financing. ICVA and Germany currently serve as co-convenors of the Grand Bargain reporting workstream. 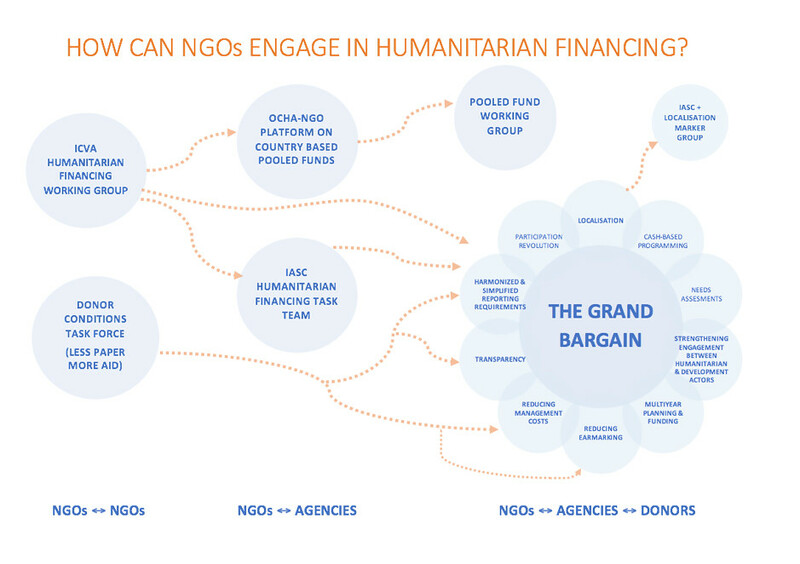 ICVA’s Humanitarian Financing Working Group and Donor Conditions Task Force both work on particular aspects of the Grand Bargain’s implementation. Partner capacity assessments of humanitarian NGOS- fit for purpose?